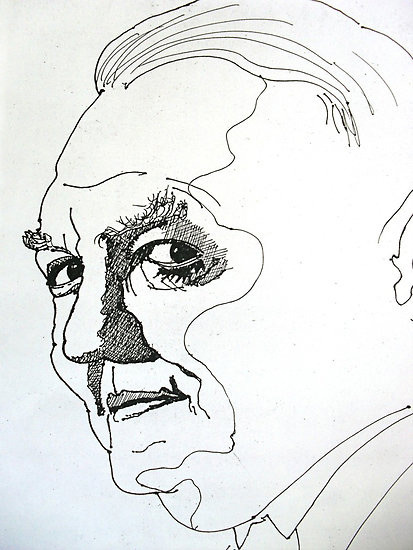 Mixed media artist Richard Tuvey is a powerhouse of creative energy! 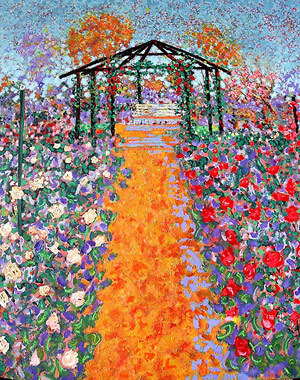 From his Post-impressionist landscapes that sizzle with color to his black and white pen and ink portraits, Richard's work embodies numerous styles, media, and techniques. When I explore Richard's extensive gallery of work, the word "experimental" immediately pops into mind. He frequently creates artwork in more media than I can count on one hand, and delights in making art from unconventional means – from pouring bleach onto fabric to purposely distorting photocopies of his ink portraits. Richard's experimental attitude towards art embraces the true artist's spirit of curiosity and discovery. 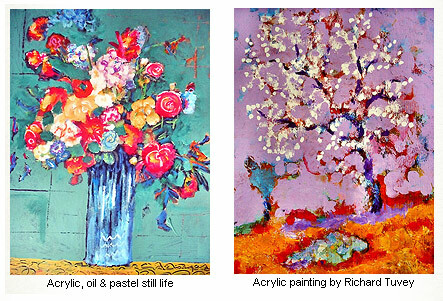 Read on for an inspiring interview with Richard, and find out more about what makes this prolific mixed media artist tick! I was born in London, England in 1945 and traveled to Australia for a holiday in 1965 and I have lived here ever since. 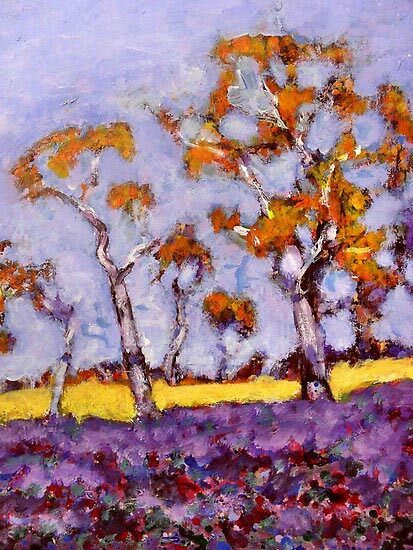 I began painting post impressionist landscape paintings in 1970 as I was and still am in absolute awe of the Australian landscape. To begin with I was self taught and for the first seven years it was difficult, as learning from art books etc can be very slow going, but eventually everything fell into place and I was fortunate to win my first art prize in 1977. Over the years I have furthered my interest and love for art by studying at Charles Sturt University in Wagga Wagga and I have been fortunate to have been awarded a Diploma in Art, a BA in Fine Art with Honours and a Masters Degree in the Visual Arts. You create art using a wide range of media. 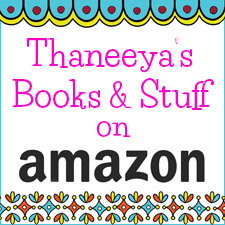 Can you list for us some of the media you work in? When I paint impressionist landscapes, still lifes, and portraits I usually begin with acrylics which dry quickly and then perhaps apply oils, inks, oil pastels and even wax which I use as a masking agent to finish the work. Which medium is your favorite (if any), and why? Acrylics because of their quick drying capacity and their flexibility along with wax are my favourite mediums. How would you describe your art and your artistic process? I can and do often paint in a number of different styles. With regard to my post impressionist landscapes I prefer to go to the location and sit and study the scenery. Using my eye as a camera I soak up the light, the colour, the shade, the texture etc. I then go home and paint and in this way I am forced to use my imagination and the work becomes creative. I may sketch the landscape but only as a reference point. It has been said that using this technique a person can hold the image in their minds eye for eight hours but after that you would have to go and look again! Painting abstracts are different in that I may start with an idea and make a painting mark which can often be chaotic and somehow I have to bring this chaos into order (this is indicative of my own life). It is interesting to note that Jackson Pollock, the abstract expressionist artist, worked in reverse - he painted a recognizable scene etc and would then abstract it turning it into chaos (indicative of his life). 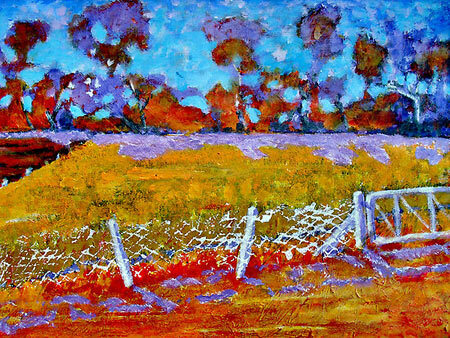 My favourite subject matter is the Australian landscape, be it abstract or post impressionist. The fact that I was born in London and very rarely ventured into the English countryside has given me a deep appreciation for nature, in particular the forest region near where I live. Can you tell us about your latest work of art? My latest artwork is entitled "Two Dams" (shown right). This is my interpretation of an Australian landscape using the medium of abstract expression. The materials used are acrylics, inks, wax, plaster and textiles and it refers to the floods experienced in Australia in one State whilst there was a drought in another State. Who are some artists you admire, and why? There have been a great number of artists who have influenced my own work over the years. The post impressionist Vincent Van Gogh would have to top the list. I dreamt once that I was in his presence but that I was to shy to talk to him - isn't that sad, to be shy even in a dream!!! Claude Monet and his truly beautiful impressionist landscapes, so full of light, have had a profound affect on me and my work and this can be seen in a number of Rose Garden paintings I have made! Henri Matisse and his colourful Fauve paintings have always captivated me and again this can be seen in a number of Fauve paintings that I have made! There are more - Basquiat, De Kooning, Pollock, Tapies, Dubuffet… all too many to mention! It has been said that creating an artwork is the closest a man can come to giving birth and for me the actual act of being creative is a spiritual high! Do you have any tips for people who would like to improve their art skills? Many thanks to mixed media artist Richard Tuvey for such a fabulous interview! 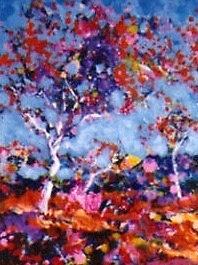 You can see more of Richard's artwork at RedBubble or at Richard-tuvey.artistwebsites.com. His artwork is available for purchase at both sites as prints, posters, stretched canvas prints and greeting cards. Learn more about mixed media art. Get inspired! Check out more interviews with Featured Artists.